Coppicing is the process of cutting trees down, allowing the stumps to regenerate for a number of years (usually 7 - 25) and then harvesting the resulting stems. It makes use of the natural regeneration properties of many tree species, including Oak, Hazel, Maple, Sweet Chestnut, Lime and Ash. Cut such trees down and they will regenerate from the cut stump, producing many new shoots, rather than a single main stem. Regrowth can be exceedingly rapid, with new shoots growing as much as 5cm a day. Oak stems can exceed 2m growth in one season, while Sallow may grow to almost 4m high in the first summer1. 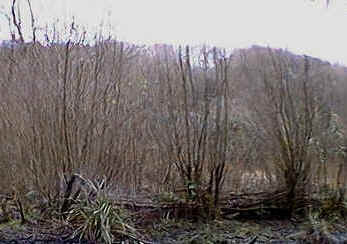 The word 'coppice' is derived from the French 'couper' which means 'to cut'. 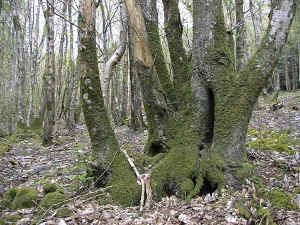 Coppice trees and their produce are known as 'underwood'. The cut tree stump is known as a stool and the shoots, depending on their harvested size, as rods, poles or logs. The shoots are harvested on a rotational cycle. This means that they are left to grow for a certain number of years and are then cut, whereupon the whole process starts again. Coppiced woods are either cut according to demand or will more usually be divided into a number of compartments. One of the compartments, or coupes, will be cut each year within the rotational cycle. The length of the rotational cycle will depend on the tree species, as well as the projected use of the product. A typical rotation might be on a cycle of 7 - 8 years. Many traditional uses require 7 - 15 year old material, although some modern commercial use may take larger material, up to 30 years old. Coppicing has been practiced in British woodlands for centuries. As a result of the rotational cutting sequence, at any one time there would be coppice at various different stages of regeneration within the woodland. In this way, wood was produced for a variety of uses, in an elegantly sustainable way. Historically, long rotations were used which would provide really sizeable timber. 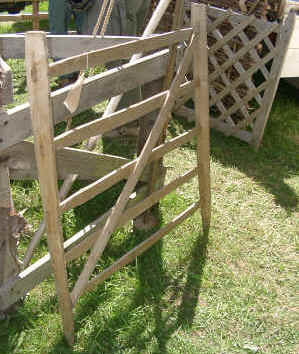 Coppice products included ships planking, timber for half-timbered Tudor houses, as well as smaller items such as pea and bean sticks, firewood, charcoal, furniture, sheep hurdles, baskets, fencing, hedging sticks, tool handles and brooms. 1 Oliver Rackham, 2001, Trees and Woodland in the British Landscape.